Crowns and bridges are prostheses that are cemented permanently onto existing teeth or implants. 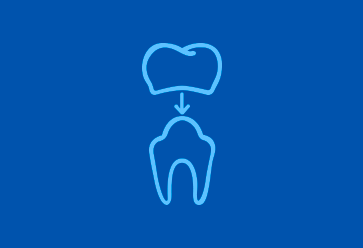 A crown is used to cover completely a destroyed tooth, so as to improve the appearance, shape or alignment of the tooth. It can also be placed on an implant to achieve the shape and functional structure of the tooth. The procedure consists in preparing or reducing the tooth, so as to create the necessary space and to be able to put our crown in place. Bridges are often used to replace one or more missing teeth.